The Point Lookout Peninsula in Maryland juts south into the Potomac where the river meets the Chesapeake Bay. During the Civil War, the Federal Government quickly converted a resort on the point into a military hospital. After the July 1863 Battle of Gettysburg, the Union established a prisoner-of-war camp at the site. By the end of the war, more than 50,000 Confederate prisoners had passed through Point Lookout’s gates, making it the largest prisoner of war facility in the north. The soldiers who died at the prison camp are now buried at Point Lookout Confederate Cemetery located north of the historic prison. Two memorials stand commemorating the Confederate soldiers buried in a mass grave at the cemetery. Point Lookout is a peninsula located at the confluence of the Potomac River and the Chesapeake Bay. The point has a storied past; Captain John Smith explored the area during his 1608 voyage around the bay, and later the first governor of Maryland, Leonard Calvert, claimed the point for his personal manor. Its name comes from its status as a lookout position for American forces during the Revolutionary War and the War of 1812. In 1857, William Johnson purchased land on the point to create a resort at the very tip of the peninsula. Five years later, the Federal Government converted the resort buildings into a military hospital complex. The Hammond Hospital opened in August 1862. At the Battle of Gettysburg in July 1863, Union forces captured thousands of Confederate soldiers. Point Lookout was one of numerous military facilities hastily established as prisoner of war camps. Officially named Camp Hoffman, the 40-acre prison compound was established north of Hammond Hospital. A 15-foot tall wooden fence surrounded the compound, while guards kept watch from a gallery at the top of the fence. At the end of August 1863, Point Lookout’s stockade held more than 1,700 Confederate soldiers. The prison population swelled to 9,000 by the end of the year. During the summer of 1864, the prison population grew to 15,500, well more than the stockade’s designed capacity, and reached 20,000 in June 1865. Conditions for the prisoners severely worsened as the population exploded. The military did not construct barracks or other permanent housing; instead, tents provided inadequate shelter from the sweltering summer heat and brutal winters. Contaminated water, meager rations, malaria and typhoid fever, and exposure to the elements led to a high death rate in the camp. Approximately 4,000 of the total 50,000 Point Lookout prisoners died while incarcerated. Two cemeteries on the peninsula were established for the Confederate dead, a third cemetery contained Union soldiers who died while under care at Hammond Hospital. The prison closed shortly after Robert E. Lee’s surrender at Appomattox. In 1866, the U.S. Quartermaster General’s office surveyed the peninsula to discern the appropriateness of establishing a national cemetery at Point Lookout. Eventually, the military transferred the Union remains to Arlington National Cemetery outside of Washington, D.C. The Confederate cemeteries remained in place until 1870, when the state of Maryland transferred more than 3,000 remains to a new site further north along the peninsula near Tanner Creek, and now known as the Point Lookout Confederate Cemetery. Identification of individual remains was impossible, necessitating burial in a mass grave. 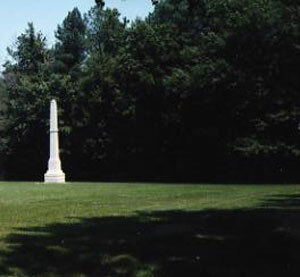 The site was marked by a 25-foot white marble obelisk erected by the state of Maryland in 1876. In 1910, the state transferred ownership of the cemetery to the Federal Government. To mark the common grave of Confederate soldiers, the government erected an 80-foot-tall granite obelisk. The Van Amringe Granite Company of Boston constructed the Point Lookout Monument, completing the work in May 1911. Bronze tablets, both affixed to the monument and set around its earthen mound, carry the names of 3,382 known Confederate soldiers and sailors. 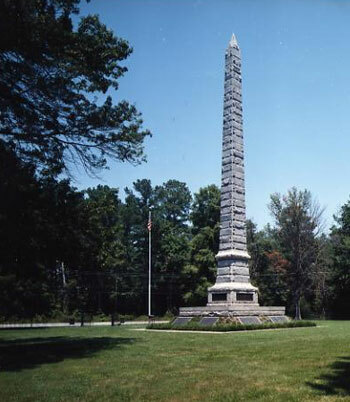 At the time of the monument’s erection, the Maryland obelisk was moved to the location of one of the original prison cemeteries, and a bronze plaque was affixed to the base of the monument, which provided a history of the move. The State Monument returned to the Point Lookout Confederate Cemetery in 1938 when the Federal Government sold the other properties. Point Lookout Confederate Cemetery is located on Maryland Route 5 (Point Lookout Rd. ), roughly two miles south of Scotland, MD. The cemetery is open for visitation daily from sunrise to sunset. The cemetery is overseen by the Baltimore National Cemetery; its administrative office is open Monday-Friday from 8:00am to 4:30pm. It is closed on all Federal holidays except for Memorial Day. For more information about the Confederate cemetery, please contact the national cemetery office at 410-644-9696, or see the Department of Veterans Affairs website. While visiting, be mindful that our national and Confederate cemeteries are hallowed ground. Be respectful to all of our nation’s fallen soldiers and their families. Additional cemetery policies may be posted on site. Histories of Point Lookout Prison Camp are available online through the Maryland Online Encyclopedia, a project of the Maryland Historical Society, the Maryland Humanities Council, the Enoch Pratt Free Library, and the Maryland State Department of Education, and the Maryland Department of Natural Resources. Point Lookout Confederate Cemetery was photographed to the standards established by the National Park Service’s Historic American Landscapes Survey.